Our new flavored Aloe vera juice is a premium aloe product with a great taste. 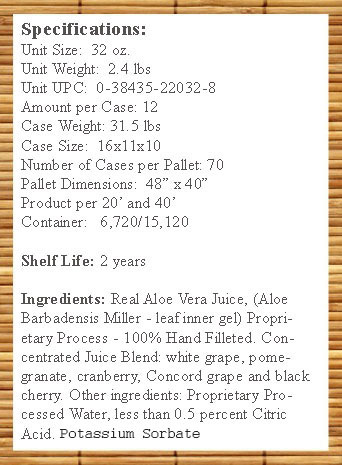 It is comprised of a quality blend of 5 all Natural, concentrated fruit juices. The blend we have selected includes Pomegranate, Cranberry, Black Cherry, Concord Grape and White Grape juices. We have carefully selected these juices for their concentrations of vitamins, minerals, amino acids, phyto-nutrients, and anti-oxidants. We have used the concentrated form in an effort to maintain the integrity of a high quality aloe product with over 90% Real Aloe Juice. my favorite blend. I am more of a Cranberry kind of guy. just what I need to perform my best throughout the day."